A post based on my responses at the Autodesk Forum: Tangent Circle to Tangent Circle. I see Revit behaving this way, they regard the first point as ineligible to being tangent because it depends on the bearing of the line, With that assumption or bias, the first point is necessary to make a tangent condition possible. I can easily snap to a location on the circle (a pulley for example) that couldn't be tangent to the next pulley. AutoCAD deals with this in a clever fashion (when we invoke the tangent snap) by fixing (changing) the first point to be tangent after the second point is placed. If we aren't careful with our second pick point (snap tangent too) the tangent line might end up on the opposite side of the pulley. In contrast, Revit handles it naively, because it regards our first point as ineligible to tangents because it isn't considering this particular end result: "I want to draw a line tangent to two circles". 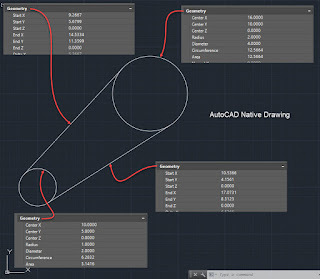 AutoCAD appears to know this by virtue of snapping tangent for the first point so it can adjust the final bearing, and attachment to the circle, of the line. To get around this naiveté, I place the first point on the pulley where it looks like it can be tangent, to my eye. The second point snaps to tangent with the icon. I return to the first point and grip/drag it away and back to let the snap icon appear, to fix it for tangent, just to see if I was close. If my guess wasn't accurate, it is now. After reading a reply to my comments I did a quick sketch in AutoCAD and then did the same sketch in Revit using the same pulley sizes and offset from one another (see Footnote). The tangent lines have the same x/y properties for start and end as the AutoCAD version, that I made using its snap tangent. This is the native DWG sketch and properties screen captures for each element. 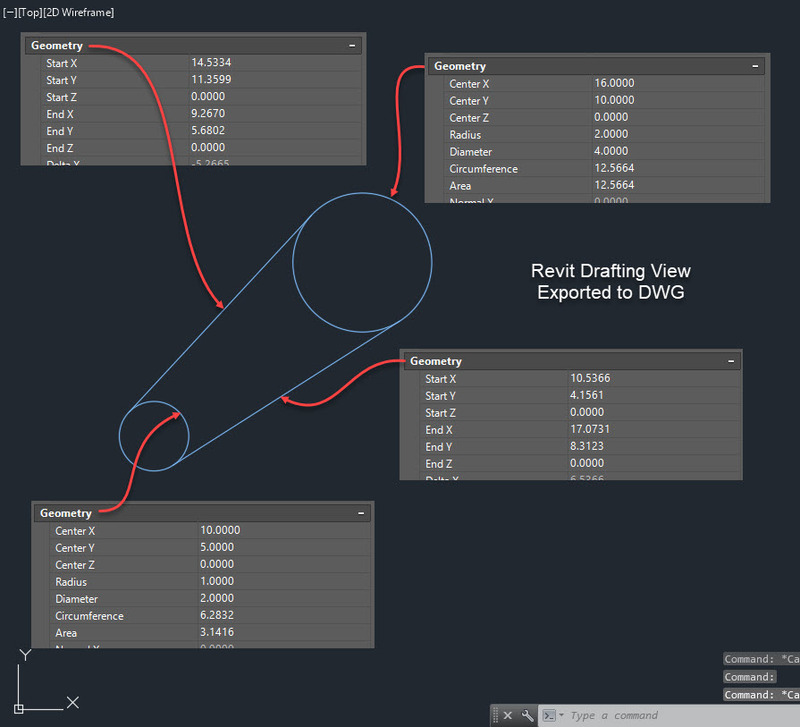 This is same information but for the Revit drafting view exported to DWG. 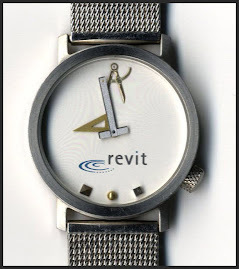 When I create an External Reference of the exported Revit drafting view it lands right on top of the native sketch. If you look really closely you'll see a value is slightly different in the Revit version. I think that might be my fault, sketching. Regardless, I think close enough is fair. Footnote: Regarding a drafting view aligning with a DWG file after export: It might not be obvious but drafting views have an origin. To test that claim link a DWG, that has a marker at the WCS origin, into one and you'll see where the origin is. I did that before I did any sketching so I'd know how to place the pulleys in the same place. That made it possible to compare the tangent lines after exporting it to DWG. Also the Start and End X/Y values are reversed. That's either just how Revit interprets the vector of each line segment or it's because of the direction I chose to sketch them in Revit. In AutoCAD I started at the smaller pulley. I didn't make sure to sketch in the same way in Revit, sloppy scientist. From time to time I've heard people ask about putting the dimension value on the line (inline) instead of above the dimension line the way Revit prefers. The only way we can do it within Revit is to manually grip and drag the dimension value down to the line. More recently I read a thread at the Autodesk Forum asking about this. The premise in their situation is that it is a significant roadblock to using Revit for one of their client's projects, it doesn't meet their drawing standard unless the dimensions are inline. I was trading messages with Aaron Maller and mentioned it to him. Aaron was trading messages with John Pierson and a few minutes later I learned it is possible with Dynamo and a custom node. This morning he shared this with me, as well as replying to the thread. Nicely done John! We are sooo connected these days. Grist from a recent support conversation..."How often should we use Synchronize with Central (SwC)? We have some users doing it every minute." The number of people actively working on a file affects the truth of the statement too. Every 30 minutes, for example, is too infrequent in my opinion. My own habit is to SwC as often as I complete any given task. I tend to take small bites, tasks that are 1-10 minutes, and SwC as soon as they are done. More frequent SwC is less data transmission than every 30 minutes, potentially. Replacing or reloading a title block for 1,000 sheets is not a small task and probably ought to be done at lunch, advising people to create new local files afterward. Otherwise each sync will need to needlessly update each local file's copy of the sheet's title block too, for everyone. If that is done while they are all away they just inherit the new version of the project with their new local file. It's all relative though because the transaction comparison between syncing that kind of change and closing a model and opening it later is subtle. In fact opening a file again might be slower, but reasonable, depending on how many people are involved. It can be justified though, especially if they are out of the project anyway such as out for lunch or after hours etc. I think it is more important to be aware of other users also using SwC, than imposing a specific time requirement. When more than one person uses SwC at the same time Revit has to parse those changes and it does so, more or less, in a single threaded manner, not like a multi-thread OS (though they are improving that all the time) doing simultaneous tasks. It has to reconcile changes and move to others once it is satisfied it can finish successfully. The more people forcing Revit to do that at the same time the slower it gets for everyone. That's where the advice to schedule or increase the time between SwC came from. One client decided to build their own tool so users can see if someone is syncing. A button on their Quick Access Toolbar parked next to the SwC button is red when someone is syncing and green when nobody is. Green means go for it. Any sort of "Every 30 minutes" rule is often an over simplification, a rule meant to be easy to implement. In practice it can be just as harmful as helpful. If I slip and go 60 minutes or longer then that starts to slow down SwC times for everyone else too. Pushing and pulling data through a pipe takes time, smaller chunks of data generally take less time and less time to reconcile with the model too. I'd focus on developing awareness of other users syncing as the priority and it's increasingly important the more users that are working on the same project file. A lengthy exchange at Autodesk's User Forums about this subject reminded me that I've meant to create a short video to describe how they relate to each other for quite awhile. This morning I saw our cutting boards drying next to the sink and realized they could serve as metaphorical coordinate system planes (Project and Survey) work in Revit. I am curious if readers find it helpful. The original post at the forum dealt with a few projects that had been modelled very far from Revit's Internal Origin/Startup Location. I looked at one of the project files and found the Survey Point and Project Base Point had been moved very far away while unclipped. The modelling started there, really far far away. They started to experience some of the negative symptoms that can occur and started looking for solutions...thus the original post. The short answer is they needed to move their model closer to the origin. No other way around it. I've been very fortunate over the years to find project delays, postponement or cancellations easy to deal with. This year each of those things have happened at the same time. As such I'm putting it out there that, to use the phrase from the very British TV show "Are You Being Served? ", "Mr. Stafford are you free? Why yes I'm Free!" I'd be pleased to hear about training, implementation, modelling ...anything Revity...that I can help with! Just send me an EMAIL.